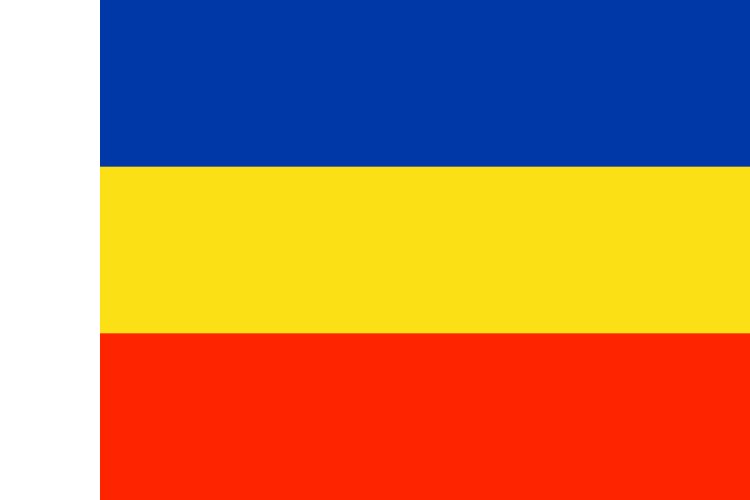 The flag of the Russian Oblast of Rostov consists of a horizontal triband of blue, yellow, and red with a small vertical band of white by the hoist. This flag is based on the flag of the Don Republic in 1918, a short-lived independent self-proclaimed republic formed after the collapse of the Russian Empire. The horizontal colors represent the three peoples who lived in the region: blue representing the Cossacks, yellow representing the Kalmyks, and red representing the Russians. The white vertical band was added to symbolize the unity between these groups. This flag was adopted for the Rostov Oblast on October 28th, 1996.